Anyone who thinks of the words “organic” and “modern” as mutually exclusive hasn’t discovered the work of Andrianna Shamaris. 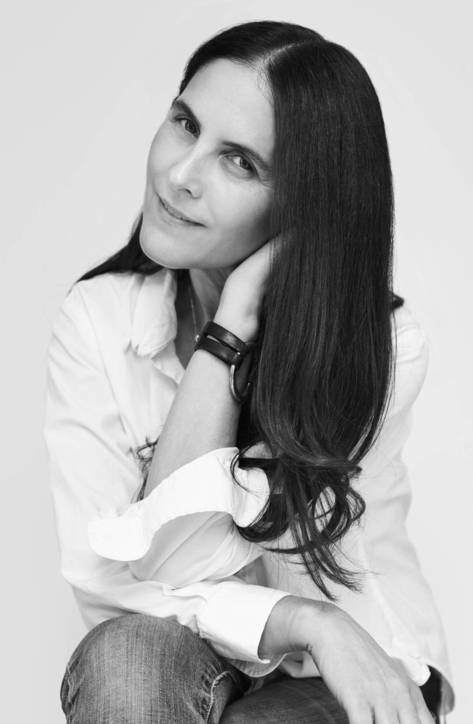 Born and raised in London, she has had strong ties to Southeast Asia for the past 25 years, first as a hunting ground for antiques, furniture, and textiles sold in her series of stores in Santa Fe, Santa Barbara, Los Angeles, and Malibu, and since 2004 as more of a creative laboratory for the striking forms she finds, designs, and produces on the Indonesian island of Sumatra. What is a typical day like when you are working at your studio in Sumatra? My day there starts at around six in the morning. I have many people from all over the islands bringing me things, sourcing things for me, so I spend a lot of time dealing with people—they’ll find me the most beautiful indigo textiles, for example, and those I make into beautiful pillows or add suede to them. Or someone will say, “Come with me. I’ve just found this log that’s been buried for a hundred years.” That’s like finding gold—a big, dense slab of wood, rosewood or teak, usually. So I do a lot of different things in the course of day, and into the night. It’s even more non-stop now that you can get Internet access everywhere. I’ll be e-mailing New York at one in the morning, because Sumatra is twelve hours ahead. 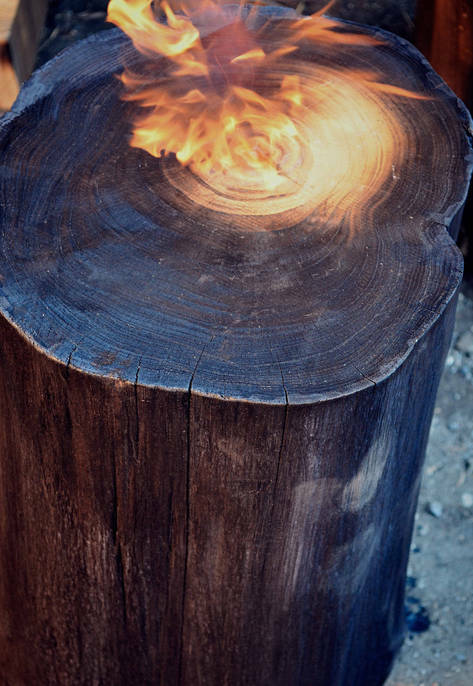 How do you choose the wood for your pieces? I’m very selective with my wood and when I find it, I instantly know what I’ll make. I’ll go through the jungle and find fallen trees. Or there are fires there, and some of the wood’s been burned, and we leave those burns. 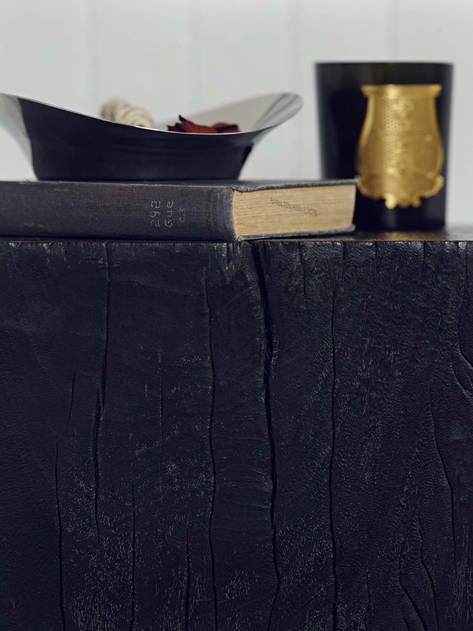 Recently I was shown this beautiful black petrified wood log with white on the outside, which is really hard to find, and we made some little side tables out of it. 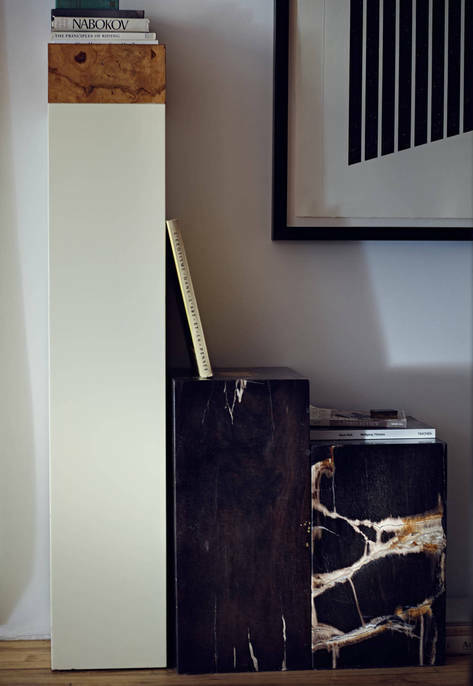 Whether a small cube or a large coffee table, all of your pieces have a remarkable sense of proportion. Is it all a matter of intuition? I’m always thinking what the wow factor is going to be. And it really all depends on the wood. Sometimes it doesn’t have to be a huge piece, like these new pieces we are doing with a solid bronze base. I think they look like little jewels. If we did them any bigger I think it might look a bit garish. But then I’ve got a beautiful table in the store that’s twenty feet long. Several people have said to me, “Why don’t you cut that up and make four different tables out of it?” But that’s just crazy. When you’ve got something of that length, it’s blasphemous—you can’t cut a piece of wood up just to make money. For me it’s a matter of editing and figuring out what’s going to look best. And I do a lot of editing when I’m out in the jungle. “A lot of people that bring furniture in from Indonesia, they’ll make a phone call and order from a catalog, which is the opposite of what I do in every way,” says Shamaris. “I design, develop, and produce everything myself. It’s very selected. It’s very different.” Here, two of her petrified wood columns stand beside a pedestal designed in the 1970s by Paul Evans. 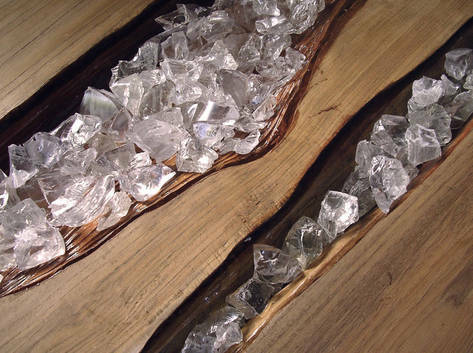 When did you begin combining materials, such as with your teak and resin pieces? I was finding really beautiful pieces of wood but there were holes in them. People suggested putting wood filler in the holes, but I hate wood filler and never use it. 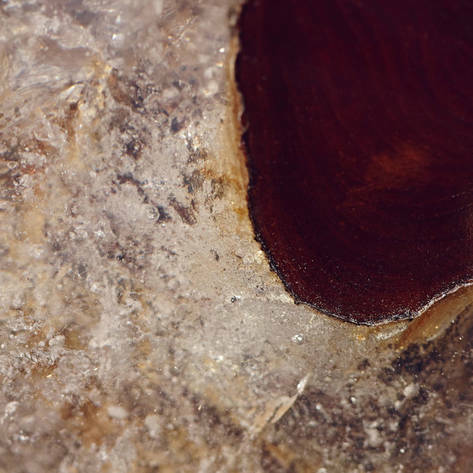 On any of my tables, if there is a natural hole, we will open up that hole, clean it out, and leave a hole—or we add the resin. That was the idea: Let’s add some resin in there and see what it looks like. 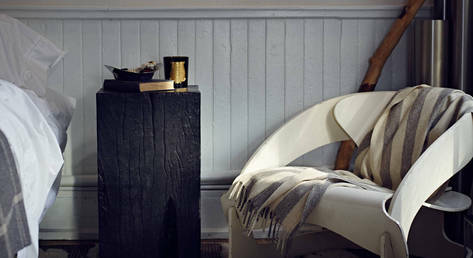 I’ve always liked modern elements and mixing them together with natural ones. 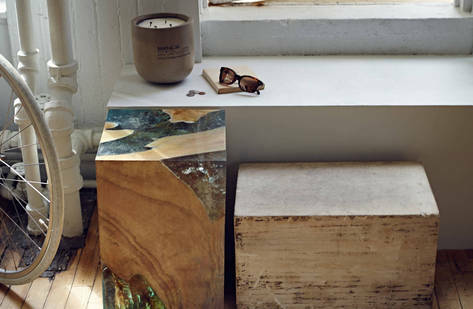 What happened when you first tried to combine the resin with the teak? My first resin collection was awful, to be honest. We had turquoise resin and bright red resin. But it’s all trial and error. Now I stick to doing it only with pieces that have a certain depth, because that’s how you get the effect of a quartz crystal. When the resin mixes with the wood, it can take on these golden and amethyst tones. So we often use clear cracked resin, which is never truly clear because you’ve got the colors of the wood, or we use a touch of green—I call it mint—that looks like emerald. For the St. Barts collection, we add aqua-colored resin and the resulting color is very soft, like water. When pieces of teak riddled with holes posed design challenges, Shamaris began experimenting with filling the voids with cracked resin rather than wood filler. She devised a process that makes the finished pieces resemble quartz crystals—at once organic and otherworldly. Is it a firing process that joins the materials together? It’s a very long process. People often think it’s a matter of just pouring it into a mold, but it isn’t. I make the resin and—it’s very primitive—it’s in a big bucket and we get a pitchfork and crack up the resin and put it in the crevices, so it looks like chunks of glass stuck in the wood. And then I add a special ingredient—the secret ingredient. But you’ve got to be really careful: it can’t be windy, there can’t be any dust or grit in there or it ruins the entire process. These pieces take six weeks to fully dry. Are there any other materials that you’re particularly eager to work with? I’m actually looking to do a whole line of furniture made of high-quality teak plywood. I love it. It has many, many layers, and it’s solid. I’m lacquering it, but with just one coat, so you can see the grain. With teak plywood you can make huge pieces, too, so I’m going to do huge screens and coffee tables. It gives a lighter, more modern feel. So that’s what I’m working on right now, and I’m thinking of adding solid silver or solid bronze mixed in with the plywood. It’s going to be drop-dead gorgeous.